We are calling the arrival of the Quanta Discovery Pico plus, the biggest advancement of tattoo removal in the past decade. The Quanta Discovery Pico Plus has made the Picoway obsolete. Picosecond technology is nothing new. It has been around for a number of years now. Basically this technology uses a much shorter burst of energy than the outdated Q-Switch Nanosecond lasers. 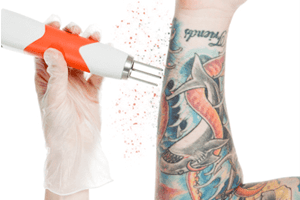 By hitting the particles of ink with a faster burst of energy, it breaks the tattoo ink into smaller particles than Q-switch lasers do, making it an easier and faster process for your white blood cells and lymphatic system to remove. 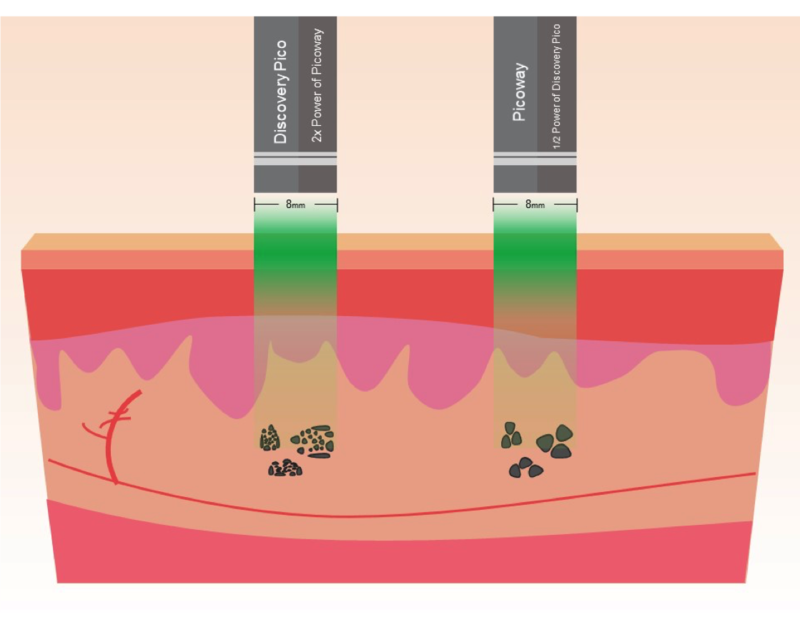 The problem until now is that manufacturers of lasers like the PicoSure, PicoWay and Enlighten have been unable to safely build enough power into their systems to send the light energy deep enough into the skin to make a real difference to your tattoo removal journey. Essentially they have been trying to break down a brick wall by throwing tennis balls at it. PicoWay, Picosure and Enlighten have all been around for a number of years, and lets be honest, the results have been underwhelming. Even our now retired and outdated Quanta Q-Plus C was achieving far better results than any of these systems. It is not uncommon for people to come into our clinic after 8, 10, 12 and even 15 sessions on lasers like the PicoWay with underwhelming and incomplete results, or even damage to the skin. The more times you expose the skin to light from a laser, the higher the chance of damage under or even on top of the skin. So WHY is the Discovery Pico better? This may take a little bit to get your head around if you haven’t worked with lasers before, so we are going to use diagrams and very simple principles of WHY the Discovery Pico Plus has made every other laser obsolete. 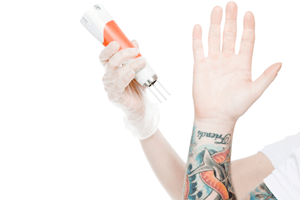 Power is everything in Tattoo Removal laser systems. 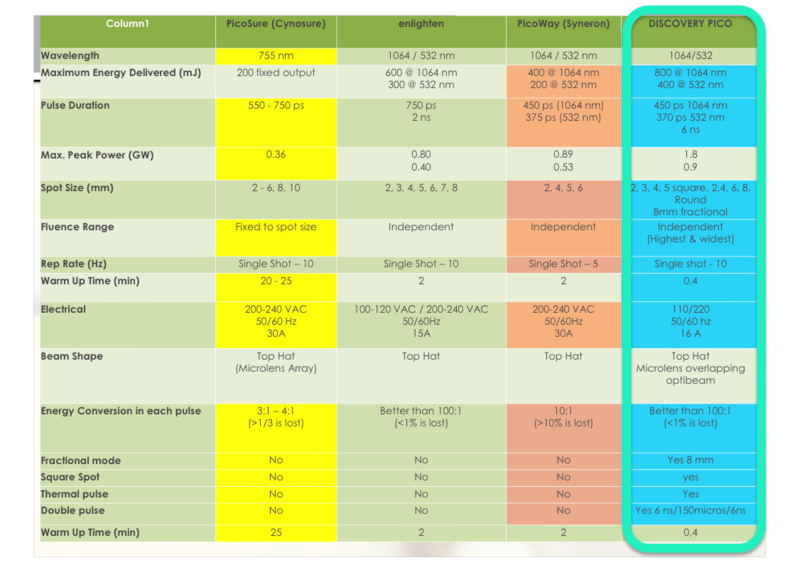 Below is a chart comparing the power of the existing Pico Technologies. The significance of the Quanta Discovery Pico having TWICE the power of the Picoway, is that we are able to spread that power over a bigger spot size. The size of the spot being used is directly associated with how deep the light will penetrate (don’t worry, we only use a maximum of 8mm which is MORE than enough to get even the deepest inks and proven as safe by the FDA). The less power available, means there is less to spread over the spot size, and target the deep layers of ink which the Picoway is often unable to break due to low level of available power.Now the craze for tattooing is decreasing and the latest trends for tattoo removal among youngsters is increasing at a fast rate that is why it is important to get it removed the safer way is a must. Below is a diagram explaining how delivering more power to the deeper layers of ink results in finer broken particles. We are able to spread double the amount of power over the same spot size as the Picoway resulting in a faster tattoo removal process, less sessions, less money, and less hassle. How sure are we that the Quanta Discovery Pico is better than the Picoway? Certain. The lack of necessary power to adequately target the deep layers of skin is why we have waited for the recent advancements in technology before moving to Pico technology. Our technology team have done the numbers, and the Discovery Pico Plus is the first laser capable of VASTLY improving the current tattoo removal industry. 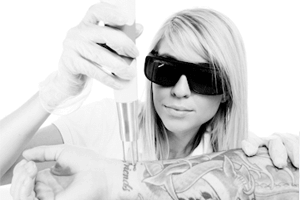 We GUARANTEE Australia’s fastest tattoo removal process. If you come to us after being treated by the Picoway (or any other laser for that matter)and we can’t improve your result, we give your money back. We also have prices at almost HALF of the nearest competitor using Pico technology. There is no other option. The science doesn’t lie, and the Quanta Discovery Pico Plus is already delivering us shockingly good results in the clinic after only a few weeks in practice. We are getting incredible feedback and will be posting never before seen results in the coming months. Even before we took delivery on this laser, we were getting Australia’s fastest, cheapest and safest results. We can only imagine how fast our clients tattoos will be coming off in the year to come. 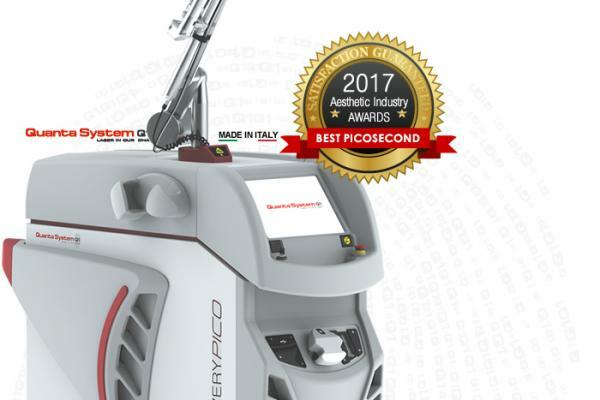 The Quanta Discovery Pico Plus was just awarded Best Picosecond at the 2017 Aesthetic Industry Awards. Think Again Laser Clinic are Sydney’s number one rated tattoo removal clinic because of our unmatched results, reputation, and affordability. We GUARANTEE Australia’s fastest results using our unmatched technology. Enquire today to see just how easy the process can be!